The families plan to go snow skiing in Colorado during the holidays were postponed due to Carolynn's back injury. She is starting to feel better which is great news. Hopefully she will be back to normal in a month or two. I know from personal experience that back injuries can take a long time to heal, especially in some of the areas of the lower back with limited blood flow. We then made plans to head south to Arkansas, but Christopher wasn't really motivated and I did not want to go alone so the decision was made to stay home and catch up on some projects, get in some long MTB rides here locally and chill out and enjoy a week with the family without too many worries. Christopher called this Christmas a Redneck one. I kind of agree with him. Especially with his new toy - Mossberg 12 gauge pump action shotgun. I must admit that the kid is very good with guns, which is kind of scary when you think about it. But seriously, he handles them extremely well and has a tremendous amount of respect for firearms. He certainly knows they aren't toys! Got in some very solid rides this week and learned some valuable lessons. Most importantly is that what would be warm enough on single track will not provide the same level of warmth when you have 20+ mph winds on a very cold day on the open road. I already knew this but it hit home hard on Christmas day when I went for a 3 hour ride. I had to bail into a QT (thank goodness it was open) to warm up. I think I actually saw Santa Clause in there or at least a fellow who looked liked a very tired Santa. I always enjoying riding on Christmas day because there is hardly any traffic and you really get to enjoy the ride. Well, at least until you start to freeze to death. For a moment there, I feared that I would end up like the little squirrel I saw on the way home. After a very wet and cold ride this afternoon working on those Festive 500 miles, I spent the better half of the day cleaning the basement. 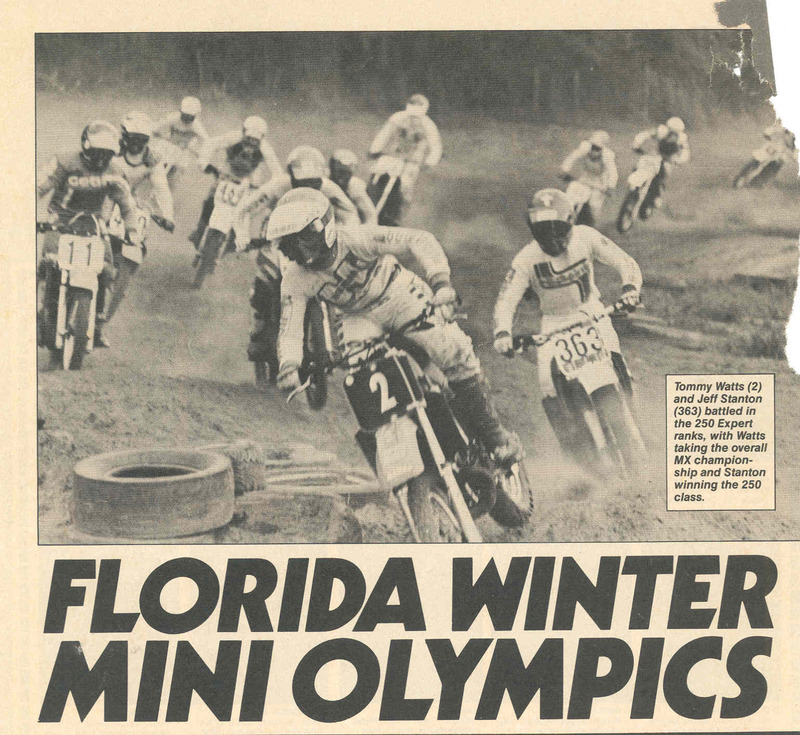 Found some old news paper clippings. Man I have been doing this racing stuff way too long. 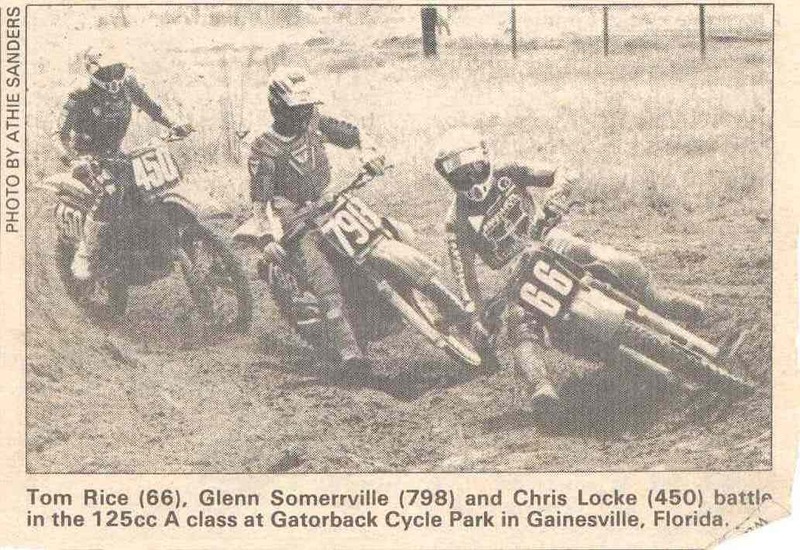 I remember racing against some top guys including 2 time super cross champion Jeff Stanton. I mention him because he will be in the 2011 Supercross special on Sunday night. I can not wait until round #1 of the Supercross season to start. 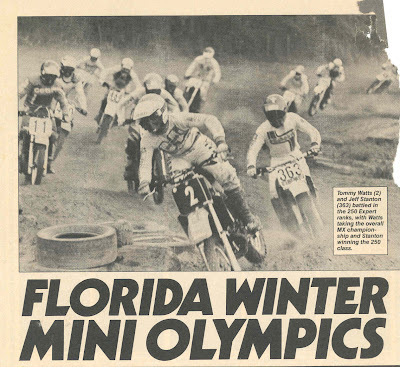 I am right behind Tommy Watts in this photo. Working it hard trying to stay with Stanton. Man that guy was a work horse and could ride a steady speed all moto long. 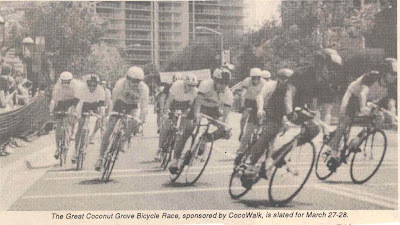 Hard to tell it's me because I was wearing a mustache - third from the left sucking some wheel back in the day racing the Great Coconut Grove Bicycle Race. I can remember getting in a three person break with two other riders who did not speak English. I think they were pros from Cuba that had defected. They had legs the size of my chest. They would try to kill you to win a messily $150.00 prize for 1st place. I good part is I showed em how it was done on that day taking the win. Tonight was the annual Festivus of Nights Gravel Grinder. 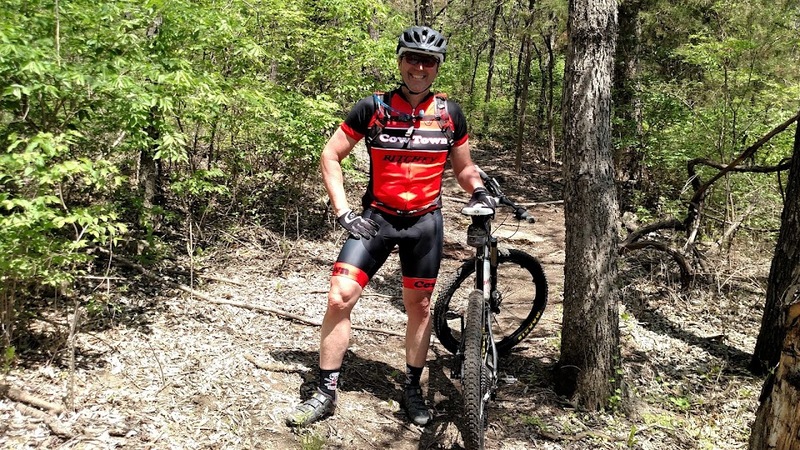 Rich Anderson hosted our ride on the Little Blue Trace trail which is just about perfect for night rides, especially when you have a group and need to stay together. We ended up doing all 29 miles of the trails (out-back). The new section that leads to Lee's Summit Road is not completely open yet, but we still some how managed to make it to the end without hurting ourselves. A very fun night of riding and perfect to burn some of those holiday calories off. Looks like there are several fun rides coming up over the holiday break. I plan to be riding everyday and am looking forward the snow that is in the forecast. Finding motivation to train this time of year is hard. But I just came across an interesting challenge that just might help. 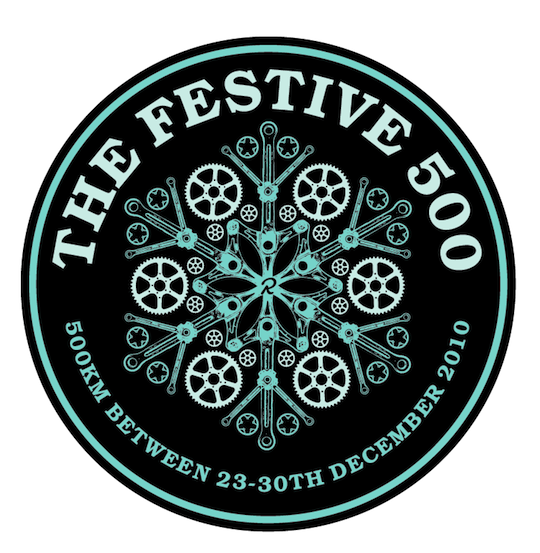 Ralph Performance Roadwear has come up with the The Festive 500 which takes place during December 23 - 30. 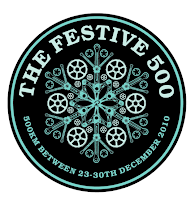 Their premise is "rather than let the holidays get the better of you, they want to see riders worldwide taking up the challenge and joining us to ride 500km in a week". coolest hats ever, so you'll get one of those, which is nice. Coolest. The race/event calendar for 2011 is starting to fill up. One of my "must do" events is the Ouachita Challenge. I have done this event for the past 4 years and even thought I have never had a great race down there something always calls me back to do it again and makes me get up at 1:15 in the morning to register before the event sells out (which it did in record time). This year Christopher is planning on participating in the Ouachita Challenge with me. He was on the fence for a few days and kept asking if the course was harder than the Dakota 50 which we both raced in during the summer. I could not answer his question because they are both very different events/courses. I think he will enjoy the event and if he puts in some saddle time should be able to finish the OC before the cut-off times. I am still working on building a program for 2011. Doing some fitness testing and bike fitting right now. The problem for me is I like to do some many things that I end of being a "jack of all trades and master of none" and we all no that in today's world you must specialize to succeed. The problem is what should I specialize in??? Saturday I had to be at work mid-morning so I was not able to partake in the Gardner Gravel Grinder. Bummer because I always enjoy a ride in hard conditions which I hear they encountered on Saturday. 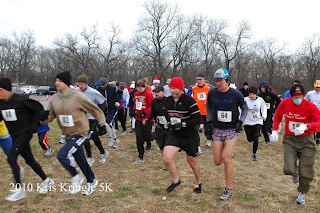 I did have time to race in the Kris Kringle 5K run out at Swope Park. A little 5K race held at the new Southeast Community Center. A very nice center which the city of Kansas City should be proud off. 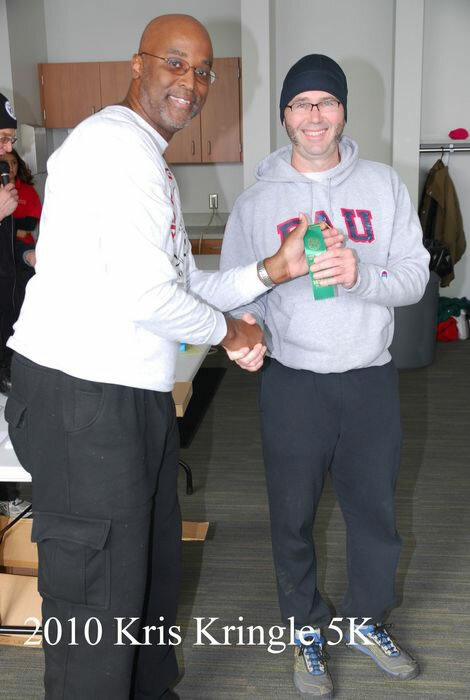 One of the reasons I signed up was to support the center the other was to do some fitness testing with my run - my biggest weakness in the past. 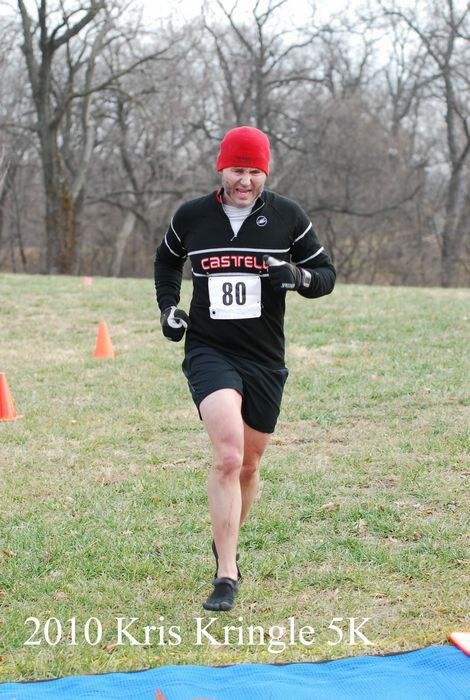 I wore my little Garmin 305 and raced barefoot. Well not really barefoot, but I did wear my Vibrams. I feel my time was a little slow running in the uneven fields of Swope Park, but still good enough for 2nd in my age-group. I do not think I will be racing the the Vibrams anytime soon. 3 days later and my calf's are still killing me and I ran slower in them than my normal trail shoes. I actually thought I would be faster but I was wrong. I guess the real question is what am I really good at anymore? Do I still have the ability to succeed in cycling or triathlons? Should I put myself out to pasture and become an adventure racer. I have never been able to excel in any one sport (well, except Motocross :-)) and that is why I think I do better in triathlons than any other sport I do. I guess my results will let me know for sure or maybe I should just do what I enjoy and do not worry about it results? I have decided that I am going to use a more systematic training method for 2011. My training plan for this past year did not work very well. Once of my worst seasons ever, but I will get to that later. Why didn't it work? Basically because I had no plan. I just did what I felt like doing at the time. I had no real measurable goals nor objectives, no schedule, no workouts focusing on my weaknesses and my biggest mistake was always training outside of my "zone". End result was becoming totally over trained and never getting enough rest. Below is one of the best "Zone" descriptions I have seen in awhile. Training comes up often, especially when riding with someone new. I always talk about training, workloads and training in the zone. So when you go flying by me this winter you will know that I am in "My Zone" and working on achieving my goals in 2011. Today was the annual Possum Trot XIV. What is such a thing? Well it is the big annual orienteering event put on by the Possum Trot Orienteering Club and is held at the Heartland Presbyterian Center out in Parkville, Missouri. It is a mass start event and covers about 15 Kilometers of some rugged terrain. Today I got to try out my new Rudy Project Rx glasses that Carolynn bought me. I got the new Magster model with transition lenses. With age my eye sight has gotten so bad that I just can not ride off-road anymore and see the trail - this is part of the reason crashed last month. And yes the chops are coming in nicely. Here is the course we had to do. Let me tell you there are a lot of hills on this thing and a heck of a lot of briars and thorny plants. No I know why most everyone was wearing these funky things on their legs. Before the start I was looking for anyone who might have earned their Orienteering Merit Badge. I did find this one guy who had a nice Cow Town hat that I need to get. He was having nothing of my offer to buy it. Eventually I did find one and once the gun sounded I was on his heels. In hind sight I should have followed my own path and used today's event to actually learn something. Well, I got all competitive and decide I would just follow this youngster. Like I mentioned above this worked for the first three controls. By the time I left control 24 I lost my young merit badge winner and was lost in the woods. I got my trusty compass out and tried to use it, but gave up once I saw a couple of my fellow participants. It just seemed easier to follow someone who knows where they are going. This only lasted for two more controls until we all got lost. I soon realized that I just needed to settle down and follow my own path. I found control 30 on my own and felt good about myself. I then used my compass (based on my limited knowledge of said device) and plotted a path to 31. Things appeared to be going well and I gain felt a sense of accomplishment t when I spotted another control. Only problem was it was not the control I was looking for. After wondering around for about 15 minutes I decided to head up to a clearing and find a location on the map (like a pond) that I could reference. Being down in a frozen creek bed was just not working for me. After just about giving up hope and deciding to give up I finally found a reference point. A large cross out in the middle of a field. A quick look on the map sure enough there was cross - I had found the holly grail. The Possum Trot club put on a very nice event. Great vibe at the event, plenty of hot food and I for one am looking forward to the next event - Shawnee Mission Park 1 Hour Score O. Until then plenty of Gravel Grinding to do and of course some more map reading practice. This time of year is one of one of my favorites. Why? There is no more pressure from events (either racing or promoting), the holidays are upon us, easier days at work, we get to spend some more quality time with the family and we get to go do things like ride our bikes on frozen gravel roads. Over the past several years riding gravel roads has become my favorite type of riding. This years gravel grinder calendar is filling up fast. Check out http://gravelgrinders.blogspot.com for complete info on local rides. The first weekly ride starts with Brett's. We have weekly gravel rides out of Stilwell every Wednesday evening. These are night rides and will require a light and rear flashing light. If you would like to add a gravel grinder yourself to our calendar please us know - email Chris. Here is a little more information and tips for our gravel grinders this year. Ride pace will be announced prior to the ride. The majority of our rides will be a moderate pace to allow proper "winter training" (i.e. Long Slow Distance). We will use a fat, old, out-of-form guy as a pacer (me). A cross bike is the preferred weapon of choice but we get plenty of MTB and road bikes out on our rides. Ride terrain will include: gravel roads, double track, levees, easy single track, hills (big ones) paved trails and tarmac among other things. Ride time will be between 2 to 4 hours depending on conditions and terrain. We are planning some longer ones which will be announced to allow for training for events like Trans Iowa. Rides are self supported and you ride at your own risk. 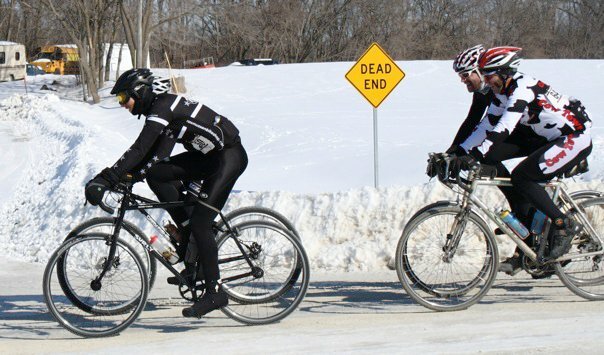 Details on rides will be posted on our Gravel Grinder site. 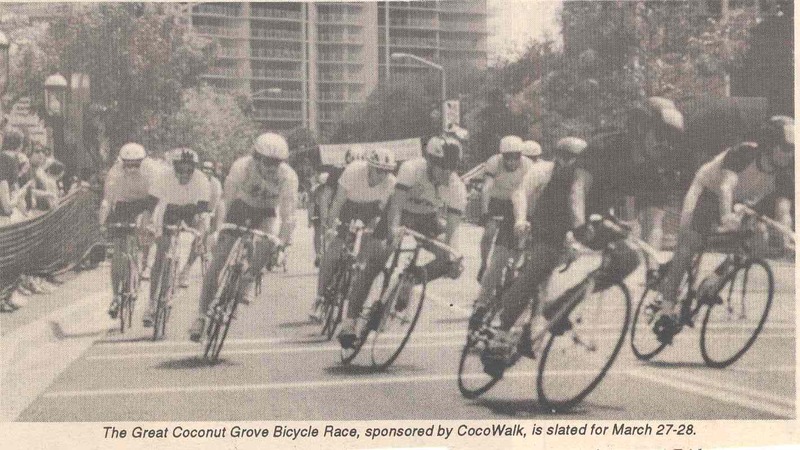 Ride start time is 9:00 a.m (unless posted otherwise for longer or shorter routes). We usually eat lunch after the ride and enjoy some food and adult beverages. 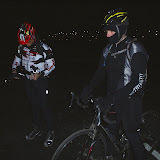 Dress in layers and use embrocation for an enjoyable ride in the cold. Keep those feet warm with a pair of winter cycling shoes - trust me they are worth it! Another thing to keep warm is your head hands. You loose a lot of heat out of your head so you can also keep a lot in with a nice skull cap. I sometimes bring a lighter cap (or ear covers) in case I heat up and need remove my thicker cap. Tip of the day: Frozen water bottles a problem? Use insulated water bottles and fill with hot water. My water bottle stays "none frozen" for most of my long winter riders when filled with hot water (or the beverage of your choice). If you use a camelback beware of frozen tubes/bit valves - keep under your clothing close to your body to keep the bit valve from freezing.